The domain within your query sequence starts at position 405 and ends at position 721; the E-value for the IPPc domain shown below is 2.2e-106. 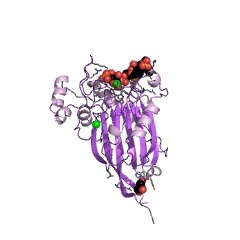 This domain is found in diverse proteins homologous to inositol monophosphatase [(PUBMED:1660408)]. 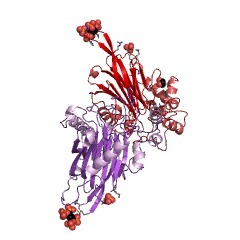 These proteins are Mg2+-dependent/Li+-sensitive phosphatases that catalyse a variety of reactions. There are 12295 IPPc domains in 12285 proteins in SMART's nrdb database. Taxonomic distribution of proteins containing IPPc domain. This tree includes only several representative species. The complete taxonomic breakdown of all proteins with IPPc domain is also avaliable. Click on the protein counts, or double click on taxonomic names to display all proteins containing IPPc domain in the selected taxonomic class. INP51, a yeast inositol polyphosphate 5-phosphatase required for phosphatidylinositol 4,5-bisphosphate homeostasis and whose absence confers a cold-resistant phenotype. Sequence analysis of Saccharomyces cerevisiae chromosome IX identified a 946 amino acid open reading frame (YIL002C), designated here as INP51, that has carboxyl- and amino-terminal regions similar to mammalian inositol polyphosphate 5-phosphatases and to yeast SAC1. 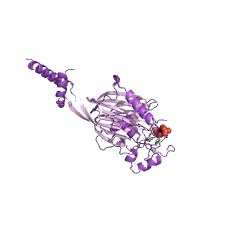 This two-domain primary structure resembles the mammalian 5-phosphatase, synaptojanin. We report that Inp51p is associated with a particulate fraction and that recombinant Inp51p exhibits intrinsic phosphatidylinositol 4,5-bisphosphate 5-phosphatase activity. Deletion of INP51 (inp51) results in a "cold-tolerant" phenotype, enabling significantly faster growth at temperatures below 15 degreesC as compared with a parental strain. Complementation analysis of an inp51 mutant strain demonstrates that the cold tolerance is strictly due to loss of 5-phosphatase catalytic activity. Furthermore, deletion of PLC1 in an inp51 mutant does not abrogate cold tolerance, indicating that Plc1p-mediated production of soluble inositol phosphates is not required. Cells lacking INP51 have a 2-4-fold increase in levels of phosphatidylinositol 4,5-bisphosphate and inositol 1,4, 5-trisphosphate, whereas cells overexpressing Inp51p exhibit a 35% decrease in levels of phosphatidylinositol 4,5-bisphosphate. We conclude that INP51 function is critical for proper phosphatidylinositol 4,5-bisphosphate homeostasis. In addition, we define a novel role for a 5-phosphatase loss of function mutant that improves the growth of cells at colder temperatures without alteration of growth at normal temperatures, which may have useful commercial applications. Identification and characterization of an essential family of inositol polyphosphate 5-phosphatases (INP51, INP52 and INP53 gene products) in the yeast Saccharomyces cerevisiae. 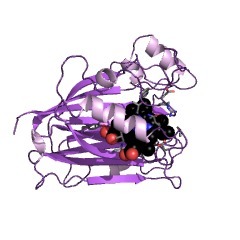 We recently demonstrated that the S. cerevisiae INP51 locus (YIL002c) encodes an inositol polyphosphate 5-phosphatase. Here we describe two related yeast loci, INP52 (YNL106c) and INP53 (YOR109w). Like Inp51p, the primary structures of Inp52p and Inp53p resemble the mammalian synaptic vesicle-associated protein, synaptojanin, and contain a carboxy-terminal catalytic domain and an amino-terminal SAC1-like segment. Inp51p (108 kD), Inp52p (136 kD) and Inp53p (124 kD) are membrane-associated. Single null mutants (inp51, inp52, or inp53) are viable. Both inp51 inp52 and inp52 inp53 double mutants display compromised cell growth, whereas an inp51 inp53 double mutant does not. An inp51 inp52 inp53 triple mutant is inviable on standard medium, but can grow weakly on media supplemented with an osmotic stabilizer (1 M sorbitol). An inp51 mutation, and to a lesser degree an inp52 mutation, confers cold-resistant growth in a strain background that cannot grow at temperatures below 15 degrees. Analysis of inositol metabolites in vivo showed measurable accumulation of phosphatidylinositol 4,5-bisphosphate in the inp51 mutant. Electron microscopy revealed plasma membrane invaginations and cell wall thickening in double mutants and the triple mutant grown in sorbitol-containing medium. A fluorescent dye that detects endocytic and vacuolar membranes suggests that the vacuole is highly fragmented in inp51 inp52 double mutants. Our observations indicate that Inp51p, Inp52p, and Inp53p have distinct functions and that substrates and/or products of inositol polyphosphate 5-phosphatases may have roles in vesicle trafficking, membrane structure, and/or cell wall formation. Phosphatidylinositols are important in intracellular signaling. In response to extracellular signals, these molecules undergo rapid turnover and generate second messengers including diacylglycerol, inositol 1,4,5-trisphosphate, phosphatidylinositol 3,4-bisphosphate (PtdIns 3,4P2) and phosphatidylinositol 3,4,5-trisphosphate (PtdIns 3,4,5-P3). The importance of phosphoinositide metabolism is underscored by its link to a human genetic disorder oculocerebrorenal syndrome of Lowe in that the gene product (OCRL) deficient in this syndrome is an inositol polyphosphate 5-phosphatase. A new pathway for formation of PtdIns 3,4-P2 and PtdIns 3,4,5-P3 has been found recently. PtdIns 4,5-P2-synthesizing enzymes phosphatidylinositol 4-phosphate 5-kinases (PIP5K) also have kinase activity towards PtdIns 3-P and PtdIns 3,4-P2 forming PtdIns 3,4-P2 and PtdIns 3,4,5-P3 respectively. Surprisingly, they can synthesize PtdIns 3,4,5-P3 directly from PtdIns 3-P in a concerted reaction. PIP5K isozymes may play pivotal roles in intracellular signaling. 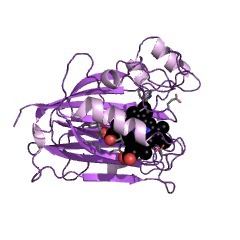 Signaling inositol polyphosphate-5-phosphatase. Characterization of activity and effect of GRB2 association. 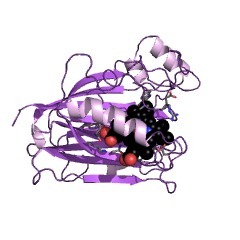 An inositol polyphosphate-5-phosphatase (SIP-110) that binds the SH3 domains of the adaptor protein GRB2 was produced in Sf9 cells and characterized. SIP-110 binds to GRB2 in vitro with a stoichiometry of 1 mol of GRB2/0.7 mol of SIP-110. GRB2 binding does not affect enzyme activity implying that GRB2 serves mainly to localize SIP-110 within cells. SIP-110 hydrolyses inositol (Ins)(1,3,4,5)P4 to Ins(1, 3,4)P3. The enzyme does not hydrolyze Ins(1,4,5)P3 that is a substrate for previously described 5-phosphatases nor does it hydrolyze phosphatidylinositol (PtdIns)(4,5)P2. SIP-110 also hydrolyzed PtdIns(3,4,5)P3 to PtdIns(3,4)P2 as did recombinant forms of two other 5-phosphatases designated as inositol polyphosphate-5- phosphatase II, and OCRL (the protein that is mutated in oculocerebrorenal syndrome). The inositol polyphosphate-5-phosphatase enzyme family now is represented by at least 9 distinct genes and includes enzymes that fall into 4 subfamilies based on their activities toward various 5-phosphatase substrates. Deletion of SHIP or SHP-1 reveals two distinct pathways for inhibitory signaling. 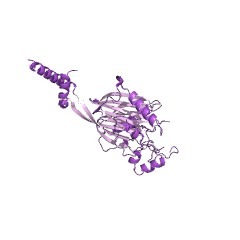 Two signaling molecules have been implicated in the modulation of immune receptor activation by inhibitory coreceptors: an inositol polyphosphate 5'-phosphatase, SHIP, and a tyrosine phosphatase, SHP-1. To address the necessity, interaction, or redundancy of these signaling molecules, we have generated SHP-1- or SHIP-deficient B cell lines and determined their ability to mediate inhibitory signaling. Two distinct classes of inhibitory responses are defined, mediated by the selective recruitment of SHP-1 or SHIP. The Fc gammaRIIB class of inhibitory signaling is dependent on SHIP and not SHP-1; conversely, the KIR class requires SHP-1 and not SHIP. 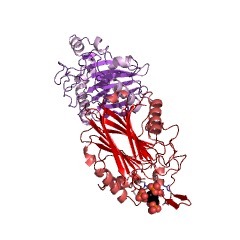 The consequence of this selective recruitment by inhibitory receptor engagement is seen in BCR-triggered apoptosis. SHP-1-mediated inhibitory signaling blocks apoptosis, while SHIP recruitment attenuates a proapoptotic signal initiated by Fc gammaRIIB. The protein deficient in Lowe syndrome is a phosphatidylinositol-4,5-bisphosphate 5-phosphatase. Lowe syndrome, also known as oculocerebrorenal syndrome, is caused by mutations in the X chromosome-encoded OCRL gene. The OCRL protein is 51% identical to inositol polyphosphate 5-phosphatase II (5-phosphatase II) from human platelets over a span of 744 aa, suggesting that OCRL may be a similar enzyme. We engineered a construct of the OCRL cDNA that encodes amino acids homologous to the platelet 5-phosphatase for expression in baculovirus-infected Sf9 insect cells. This cDNA encodes aa 264-968 of the OCRL protein. 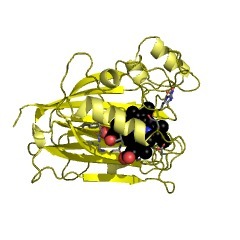 The recombinant protein was found to catalyze the reactions also carried out by platelet 5-phosphatase II. Thus OCRL converts inositol 1,4,5-trisphosphate to inositol 1,4-bisphosphate, and it converts inositol 1,3,4,5-tetrakisphosphate to inositol 1,3,4-trisphosphate. Most important, the enzyme converts phosphatidylinositol 4,5-bisphosphate to phosphatidylinositol 4-phosphate. The relative ability of OCRL to catalyze the three reactions is different from that of 5-phosphatase II and from that of another 5-phosphatase isoenzyme from platelets, 5-phosphatase I. The recombinant OCRL protein hydrolyzes the phospholipid substrate 10- to 30-fold better than 5-phosphatase II, and 5-phosphatase I does not cleave the lipid at all. We also show that OCRL functions as a phosphatidylinositol 4,5-bisphosphate 5-phosphatase in OCRL-expressing Sf9 cells. These results suggest that OCRL is mainly a lipid phosphatase that may control cellular levels of a critical metabolite, phosphatidylinositol 4,5-bisphosphate. 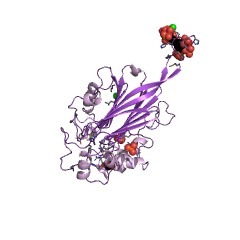 Deficiency of this enzyme apparently causes the protean manifestations of Lowe syndrome. 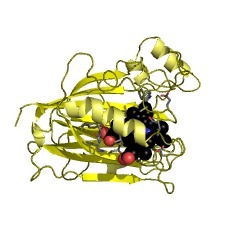 Bovine inositol polyphosphate 1-phosphatase (1-ptase), M(r) = 44,000, is a Mg(2+)-dependent/Li(+)-sensitive enzyme that catalyzes the hydrolysis of the 1-position phosphate from inositol 1,4-bisphosphate and inositol 1,3,4-trisphosphate. 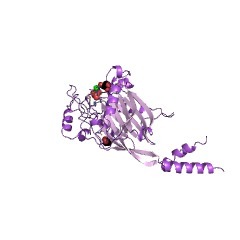 We have determined the crystal structure of recombinant bovine 1-ptase in the presence of Mg2+ by multiple isomorphous replacement. The structure is currently refined to an R value of 0.198 for 15,563 reflections within a resolution range of 8.0-2.3 A. 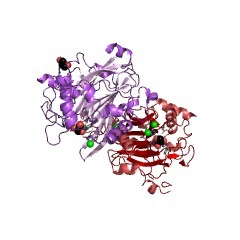 1-Ptase is monomeric in the crystal, consistent with biochemical data, and folds into an alternatively layered alpha/beta/alpha/beta sandwich. 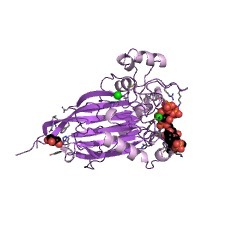 The central core of 1-ptase consists of a six-stranded antiparallel beta sheet perpendicular to two parallel three-turn alpha-helices. The beta sheet is flanked by two antiparallel six-turn alpha-helices aligned parallel to the beta sheet, and the central helices are flanked by a five-stranded largely parallel beta sheet. Two neighboring metal binding sites are located in adjacent acidic pockets formed by the intersection of several secondary structure elements including an unusual kink structure formed by the "DPIDST" sequence motif. The fold of 1-ptase is similar to that of two other metal-dependent/Li(+)-sensitive phosphatases, inositol monophosphate phosphatase and fructose 1,6-bisphosphatase despite minimal amino acid identity. 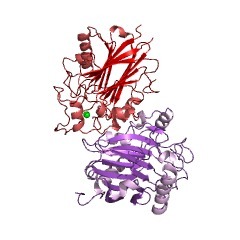 Comparison of the active-site pockets of these proteins will likely provide insight into substrate binding and the mechanisms of metal-dependent catalysis and Li+ inhibition. 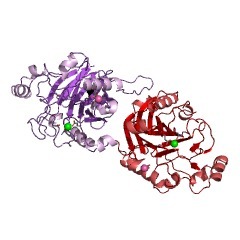 Diverse proteins homologous to inositol monophosphatase. 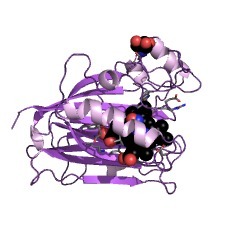 Bovine inositol monophosphatase (IMP) and several homologous proteins were found to share two sequence motifs with bovine inositol polyphosphate 1-phosphatase (IPP). These motifs may correspond to binding sites within IMP and IPP for inositol phosphates or for lithium, since both substances are bound by these proteins. This suggests that the proteins homologous to IMP, which have diverse biological roles but whose function is not clear, may act by enhancing the synthesis or degradation of phosphorylated compounds. Isolation and heterologous expression of a cDNA encoding bovine inositol polyphosphate 1-phosphatase. Inositol polyphosphate 1-phosphatase, an enzyme of the phosphatidylinositol signaling pathway, catalyzes the hydrolysis of the 1-position phosphate from inositol 1,3,4-trisphosphate and inositol 1,4-bisphosphate. The protein was isolated from calf brain and digested with trypsin or CNBr, and the amino acid sequence of several peptides was determined. Degenerate oligonucleotide primers were designed from amino acid sequence and used to synthesize an 80-base-pair (bp) fragment by the polymerase chain reaction. This product was used to isolate a 1.6-kbp cDNA with an open reading frame of 400 amino acids, 185 bp of 5' untranslated region, and 171 bp of 3' untranslated region followed by a putative poly(A) tail. The coding region of the cDNA was inserted into an expression vector that was used to obtain the recombinant protein from Escherichia coli cells. The recombinant enzyme (44 kDa) had a specific activity and other properties similar to those of native bovine brain inositol polyphosphate 1-phosphatase. It hydrolyzed both inositol phosphate substrates and was inhibited by lithium ions. The enzyme shows minimal sequence similarity to inositol monophosphate phosphatase, the other enzyme inhibited by lithium ions in the signaling pathway. SwissProt sequences and OMIM curated human diseases associated with missense mutations within the IPPc domain. This information is based on mapping of SMART genomic protein database to KEGG orthologous groups. Percentage points are related to the number of proteins with IPPc domain which could be assigned to a KEGG orthologous group, and not all proteins containing IPPc domain. Please note that proteins can be included in multiple pathways, ie. the numbers above will not always add up to 100%.